Apple thinks that the Samsung Galaxy Tab looks a lot like the iPhone and the iPad, from the appearance of the device right down to the packaging it comes in. Now it seems that the courts agree. Well, one of them at least. The Dusseldorf District Court in Germany has awarded a preliminary injunction in favour of Apple which, get this, bans the sale of Samsung Galaxy Tabs throughout the European Union (with the strange exception of the Netherlands where a separate court action is underway). Customs officials have apparently been given orders to seize shipments of the tablet, and tens of thousands of them are understood to have been seized so far today. The injunction is unusual in that it does not refer to alleged software patent violations, as we are used to in the world of hi-tech gadgets these days, but rather a design. 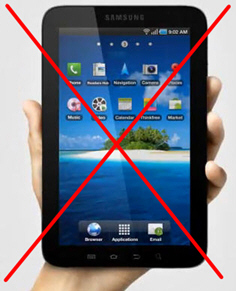 Apple maintains that the Samsung Galaxy Tab is a blatant copy of the iPad and iPhone in terms of design, and has insisted it will take any necessary measures to protect itself when other companies steal Apple ideas. Samsung, on the other hand, has said it is disappointed by the ruling and has vowed to defend itself in the on-going proceedings in order to get the ban lifted as soon as possible. The preliminary injunction could be a costly gamble as far as Apple is concerned as it is far from meaning that the case is cut and dried. Germany has a rather unusual process which allows these preliminary injunctions to be granted without notifying the company concerned in advance. Once the case is heard, and should Apple lose then it will be liable for full damages to compensate Samsung for the loss of sales that the injunction has caused. By granting the preliminary injunction, however, the Dusseldorf court has indicated that it thinks there is a very good chance that Apple will win. DaniWeb will keep you informed of updates to this case as soon as we hear about them. The 'community design' image which Apple claims that Samsung has copied can be seen here . You might want to ensure you are sitting down to prevent injury caused from excessive laughter before you view it though. Since most items are imported to the EU via Germany before being distributed further I guess it is the best location to have such an injunction in place! It sure will be interesting to see how this one proceeds over the coming months due to the increasing tensions between Apple & Samsung as well as the more general cases involving Android-powered handsets versus Apple & Microsoft. I think that this is going to turn right around and bite apple on the ... Samsung has already sued Apple for violating its own patents, so I can just see Samsung getting the iPad blocked from sales in Europe as well because of patent issues. I suspect that the price of the Galaxy Tab 10.1 units already in UK shops will go up as retailers cash in on the curiosity/scarcity factor for the time being. Sad thing is, from what I've seen of the latest Galaxy Tab (and a DaniWeb review will be published shortly) it's actually right up there as pretty much the best of the Android-powered bunch right now, and not a million miles away from iPad 2 territory either. You people should've seen the trial we had here (the Netherlands) yesterday, it almost looked like two kids fighting over eachother's treehouse ideas. It was pathetic, although Samsung seemed to be in control a little more than Apple. @katmai539 if you have any links with English articles, you more then welcome post them. Tonight (7:00PM GMT+1) I'll translate a good part of the article for you guys, it's up to Davey (or another DW staff member) if they want to publish it.